After a week of serious partying on Haad Rin, including a Full Moon Party, I headed to a small, quiet beach on the northeastern edge of Koh Phangan. 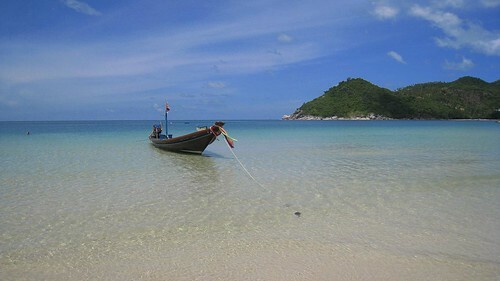 Thong Nai Pan Noi was a tropical paradise defined. The beach was small, and quiet at night, which made it perfect for late swims, with or without clothes. There were budget bungalows, and a property of luxury ones being constructed (boo!). A few restaurants offered dining and drinks on the beach, and the vibe was super casual. In the “town” which was more a collection of small stores, restaurants, bars, and massage shops, life seemed to move at a snail's pace. It was the perfect base camp to enjoy beach life, and a recovery from the party lifestyle on the island's southern end. Next week, we're heading across Thailand for a Visa run, and then on to more tropical islands. Agree with you. Thong Nai Pan is IMO the best beach to rest up on after some partying at Haad Rin. Perfectly palm tree fringed heaven!